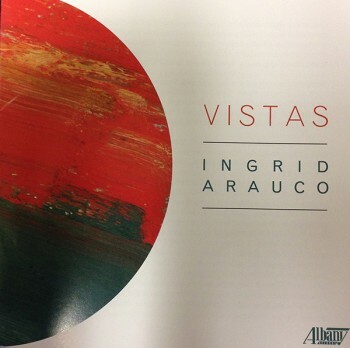 Ingrid Arauco's compositions are featured on the CD "VISTAS," recently released by Albany Records (Troy 1525). Ingrid Arauco's compositions are featured on the CD VISTAS, recently released by Albany Records (Troy 1525). Ingrid explains the concept behind the disc as follows: "The word vistas conjures up a panorama of vivid images; however, it also signifies a broad perspective encompassing many experiences over time. The works on this album, written over a thirteen-year period, comprise a series of strong musical images embracing a variety of styles. Yet together they project a unified artistic vision, which I hope is also engaging and compelling." The program includes Three for Two for clarinet and cello, Vistas for flute and piano, Trio for clarinet, viola, and piano, String Quartet No. 2, Divertimento for trumpet, violin, and cello, and Violiloquy for solo viola. Several of these pieces were commissions for organizations such as the Philadelphia Chamber Music Society, the Delaware Chamber Music Festival, and Network for New Music. The disc features an outstanding array of performers, including Charles Abramovic, Paul Demers, Frank Ferraro, Barbara Govatos, Yumi Kendall, Jeffrey Khaner, John Koen, Ricardo Morales, Hirono Oka, and Burchard Tang. VISTAS is Ingrid's second solo album on the Albany label; her previous disc INVOCATION was released in 2011. Both CDs are available at Albany, Amazon, ArchivMusic, and iTunes.